Planning the perfect catered event begins here. Alice's Restaurants have been providing award winning catered services for over 25 years! Our team of skilled cooks and servers can put together the perfect combination of exquisite foods with the right service options for your event. We serve all of southern Ontario, just let us know when and where - and we'll be there! Planning an event can be a lot of work, but we at Alice’s Restaurants are here to help. No matter what the occasion; from weddings to corporate events, pig roasts, sports tournaments to wakes – Alice’s Restaurants has the catering solutions you are looking for. We offer the convenience of a self contained, fully-stocked mobile kitchen as well as venue catering capabilities with everything from the hot serving trays right down to the cutlery. Plus we have the most diverse selection of high-quality, delicious foods available to offer. Hot, cold – or whatever you prefer – our list of satisfied clients can attest that we have the best catering options around. We handle all types of catering for arranged-seating events, open outdoor events, private functions and everything else you can think of. We offer a choice of popular pre-assembled menus for you to choose from, but our true specialty is our diversity – we’ll prepare whatever you desire. That includes desserts, snacks, light lunches, buffets and more. Contact us today to build your own custom menu for your event. We can be anywhere you need us to be. Our catering services are available far and wide throughout southern Ontario all year round. Browse our site to find out more about Alice’s Restaurants and use the “Contact Us” button or call us to begin your mobile restaurant and catering experience! See what our customers say about our services, you can read testimonials here. We're excited to announce the opening of our preparation facility! Located at 202 Jenkins Rd, Scotland, this new facility offers you the option to pick up your order from us rather than incurring delivery and setup costs. This option is perfect when you just want the meal prepared and you handle the rest. Contact us for details. 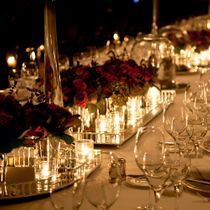 Alice's Restaurant catering has partnered with several great event venues in the Norfolk County and Brant County area. Visit our catering page for more details. Classy events which require finesse. Got a hungry crowd? Let us handle it. Buffet, family style or table service. We are able to accommodate. Meet Alice! She's the heart, soul and ambition behind Alice's Restaurants; the one who makes it all happen! Not only does Alice know an unlimited amount of delicious recipes, she has provided services at thousands of events - and knows how to help you get the best results for your catered affair. Click the image to see Alice display the Dirt Burger on The Food Network show Carnival Eats, where she was voted "Top Trailer" of 2015. Follow us on Facebook for event updates and more!